There is "Sadoh" in Japan:) I can't say it in English, but it's written "the way of tea" in Japanese. Without Sadoh, you couldn't talk about Japan. Sadoh means that "the sprit of entertaining guests by giving match." In old days, hosts entertain their guests by giving "matcha" like pic. Match is a kind of Japanese tea, and it's very bitter for people who drink it for the first time, but this bitterness is a nice point;) In sadoh, "the sprit of hospitality" is the most important point. Most of Japanese people drink *otya (means "tea") nowadays, but match is a little special for them becuse there are a lot of *sahoh (means "manners") when drinking match, so many people (even Japanese) feel that it's formal, and they don't drink it in daily lives recently. However, lots of people drink it as hobby. Host and guest usually wear *kimono, and they fold their legs under themselves. Host make match for her or his guest in special process. it's so difficult for amateurs to make match well, and they need to practice. Host put the powder of match in teacup and pour hot water in, and mix it quickly with special tools foam it. Meanwhile, guest eats *wagashi. (means "Japanese sweets") It's so sugary because match is bitter, so they can balance their tastes. When finishing to make match, host gives her or his guest match. Host shouldn't hand it directly, and should put it on floor once! Host and guest bow down to each other, and guest says "Otenami haiken itashimasu," (It means " I'll see your skill of making match.") and guest takes it. After turing teacup two and half times, (It's very important point!!) guest can finally drink it. Guest should drink all of it, and she have to make sounds when drinking the last drips. (Making sounds when drinking and eating is very important and necessary in Japanese.) After drink it, guest says "Kekkouna otemaede gozaimashita." (means "Your skill was so good. It was so delicious.") If guests are plural, they sometimes share one teacup. In that case, first guest has to say to second guest "Osakini shitsurei itashimasu." (means "I'm sorry to drink it first.") Ans first person leave some drips of it for second person. Do you wanna learn it?? I would love to learn it. It sounds very interesting. Why don't we do sadoh together next time(o^^o)v? You'll have to show me Sadoh when I come to Japan! very nice...i do not know if it is apprpriate for me to learn it, but i would like to see it sometime. Thanks for reading my post about Shiretoko. I want to go back there soon. Last weekend I climbed Tokachi-dake and Biei-dake in Daisetzan National Park. The mountains in Hokkaido are so beautiful! Your post about the tea ceremony was very interesting. I've participated in sadoh a few times - the first time I burnt my tongue because the tea was so hot! I think the most important part of sadoh is the attitude of the host and guest. Even if every part of the ceremony is perfect, a bad attitude will ruin the whole thing. Likewise, if the host and guest have a good attitude - a gracious attitude - it's ok if they make mistakes! I like zazen and ikebana - have you ever tried those? Sometimes I think it would be fun to be a yamabushi! Anyway, thanks for writing such an interesting blog. Hey, I like tea too;) Thanx for reading my blog:D I just went to your homepage. It was so lovely! Yeah. I'll have to. I should practice to make match to show you sadoh for you!! Thanks for your interest in my blog:D You like Japan very much!! In my hometown, Tomakomai, there is a mountain. Do you know? 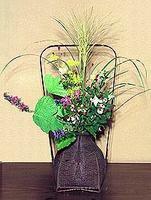 I haven't tried zazen, but done ikebana. Unluckly, I'm not gifted with ikebana:P I'd really like to try zazen once!!!! It looks so interesting, isn't it? I try to install Post Pet! I was always interested in the Japanese culture. Maybe one day I'll have the chance to see it in your country.